Curacao’s Cultural Heritage Map or Mapa Kultural Historiko di Kòrsou is a digital inventory of Curacao’s cultural heritage. The map includes a total of 2700 elements of human habitation. It provides a clear picture of 5000 years of human habitation, including the pre-Columbian, Afro-Caribbean and colonial heritage. Various historic maps, such as the detailed topographic map by J. Werbata, , dating from 1911. The Cultural heritage Map was developed by NAAM in cooperation with Amsterdam’s Bureau voor Monumenten en Archeologie (BMA) of the municipality of Amsterdam. It is a continuation of an earlier inventory by NAAM and Carmabi (the local nature research institute). This inventory was made in order to provide more insight into the local heritage and prevent the further loss of valuable cultural and historic sites. 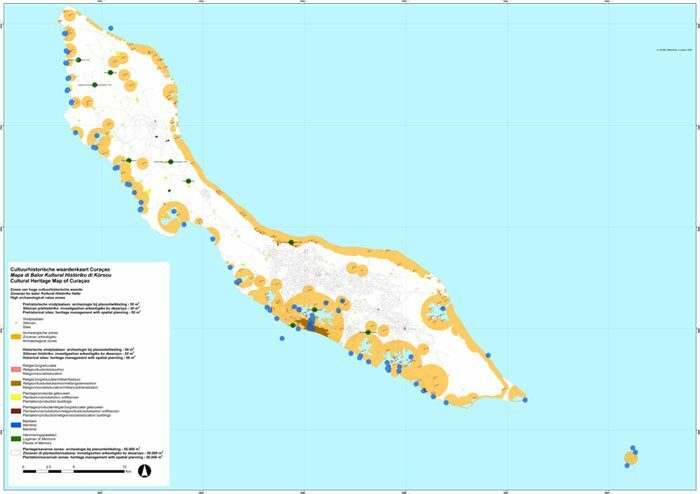 The map forms an integral part of the policy document Maneho di Arkeologia Korsou (Management of Curacao’s archeology), drawn up at the request of the Commissioner of Education and Culture.